This vehicle was donated to the Society in 2006 by Simons Group Ltd, who had acquired the vehicle in 1989 as a replica of the very first vehicle owned. 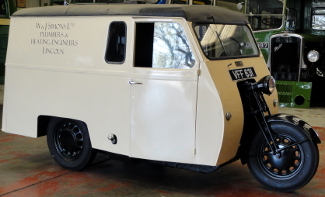 The origins of Reliant vehicles can be traced back to 1935, when a Mr T.L. 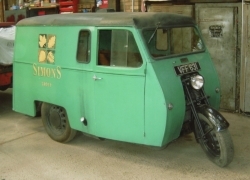 Williams took over the design of the Raleigh 3-wheeler van with a single front wheel. From 1939 the Reliant was powered by the companys own version of the Austin Seven engine, which was used up until 1963. The Reliant 'Regent' was produced from 1946 to 1954 - this is one of the later versions which included luxuries such as side windows in the doors! The history of this particular vehicle is uncertain - 'VFF' is one of the unissued 'age related' registrations that was released by the DVLA in the 1980s / 90s. Any more information would be welcome! July 2007 - Work has commenced on the bodywork framing renovation. January 2008 - The vans floor boarding has been replaced with new wood. The metal sides have also been refitted and rubbed down ready for repainting. April 2008 - Another cylinder head has been acquired and fitted. New brake cables have been fitted and a new exhaust system will be fitted shortly. Three new tyres have been fitted. July 2008- John has now started to paint the van and it should be finished in time to go on display at RAF Waddington Airshow. Following the Waddington weekend, it has moved into the Museum building and is now on display. October 2008 - The van has now moved from the Museum display area into the Spares building so that restoration can be finished - i.e. the brakes and refitting the remaining glass in the rear doors and side panels. January 2009 - The van's front wheel and hub assembly has been removed and stripped down, the brake shoes have been relined; after Christmas the unit will be refitted and 'set up'. October 2010 - The Reliant is in the new workshop receiving attention to the electrics. The rear door glass and the two small side windows have been refitted with new rubber seals. New engine mounts have also been fitted. July 2011 - Work on the paintwork plus sign writing is progressing well. July 2012 - The Reliant tricycle has been worked on by a few members in the past - unfortunately none of them managed to complete what they had started for various reasons, however, work in completing the jobs started has been quite rapid. Neil touched in the areas of unfinished paintwork to make the van look more presentable for open day at Easter then after open day Brian and Lee made a start on sorting out the dashboard / control panel that had been dismantled - this also involved some rewiring and a replacement indicator switch. They now have the van running well and most of the electrics finished. Work currently in progress is the painting of the rear lower light panel and the rewiring of the rear lights; once these jobs are completed we can get the van booked in for an MOT. July 2015 - The Regent goods tricycle has had its distributor rebuilt and it now starts, so all it needs is an MOT before it can be back on the road.